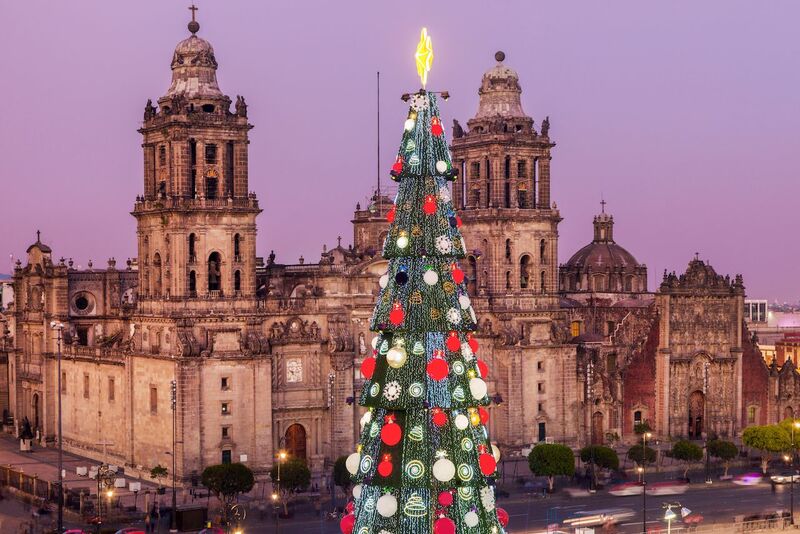 Christmas time in Mexico City welcomes the return of a gigantic tree in Zócalo Square. With the Metropolitan Cathedral behind it, the holiday display makes Centro Histórico even more scenic than it already is. In past years, the Christmas experience in Zócalo Square is completed with a nearby ice skating rink and even a light and music show. When it comes to Christmas decoration, you just can’t beat New York City. 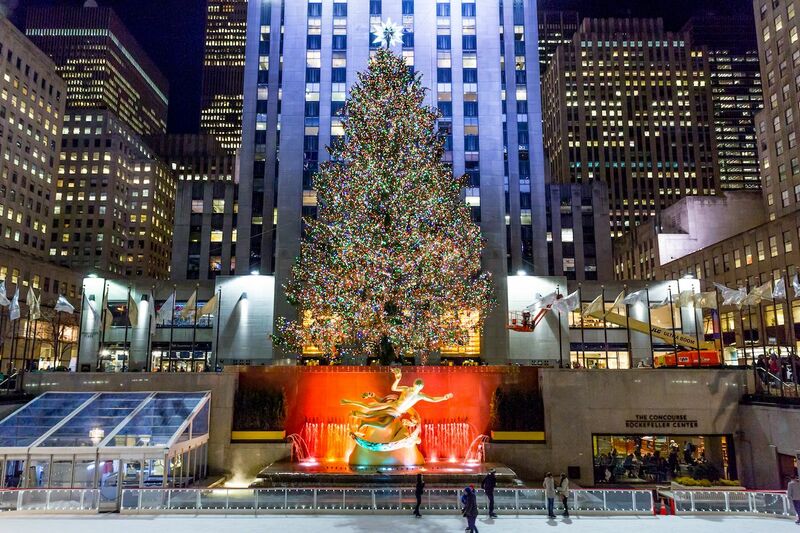 Perhaps the most famous Christmas tree in the world, the Norway spruce at Rockefeller Center usually has a height between 70 to 100 feet and is a sight to behold each year. The brilliantly lit tree is a long-standing American tradition dating all the way back to 1933 when construction workers were building Rockefeller Center. The tree typically has five miles of string lights and a 10-foot star topper made of Swarovski crystal. And not only does the tree cheer you up during the holiday season, but once it’s taken down in early January, the lumber is donated to Habitat for Humanity for in-house construction use. Florida doesn’t get any snow during the holidays (or ever), so it makes do with what it has in abundance: sand. Beginning in early November, sand is delivered by the truckload to the West Palm Beach waterfront, where sculptors begin shaping the massive pile into a 35-foot Christmas tree. West Palm Beach’s Sandi tree is the world’s only 700-ton sand tree and is illuminated with choreographed light and music shows nightly throughout the holiday season. 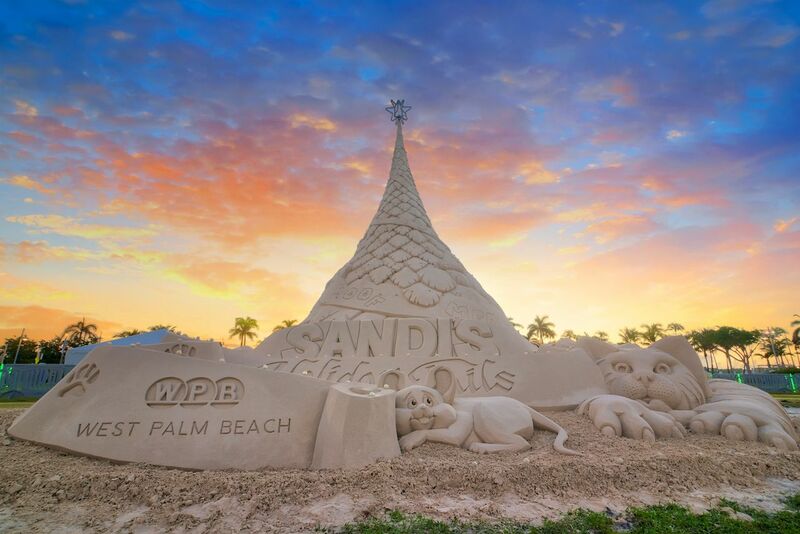 To complete the seaside setting, Sandi is flanked by four 25-ton sand sculptures shaped like mermaids, pufferfish, and other inhabitants from under the sea. Revelers like to do it big in Brazil, and Christmas time is no exception. 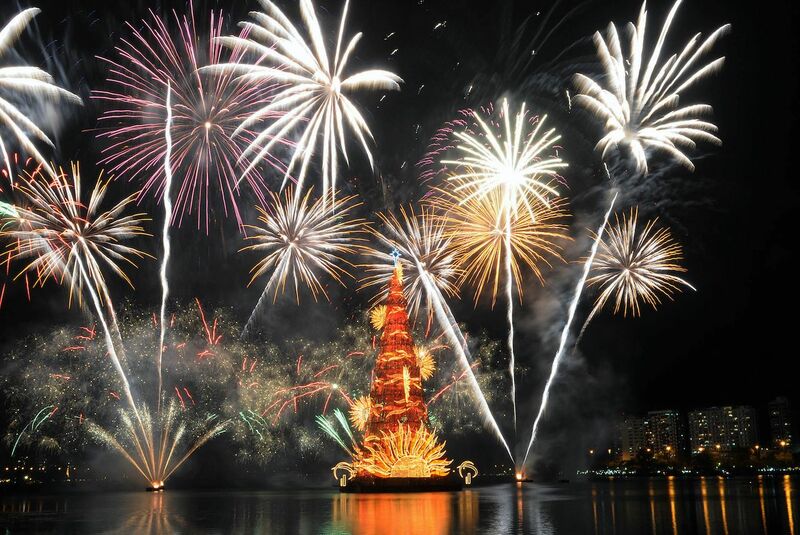 Rodrigo de Freitas lagoon in Rio de Janeiro is home to a floating Christmas tree that stretches over 270 feet into the sky, a tradition that began alongside a dazzling fireworks display in 2014. The tree has to be constructed on a barge each year and is lit up with more than three million lights. It took a two-year hiatus due to lack of funding but is making its return in 2018. 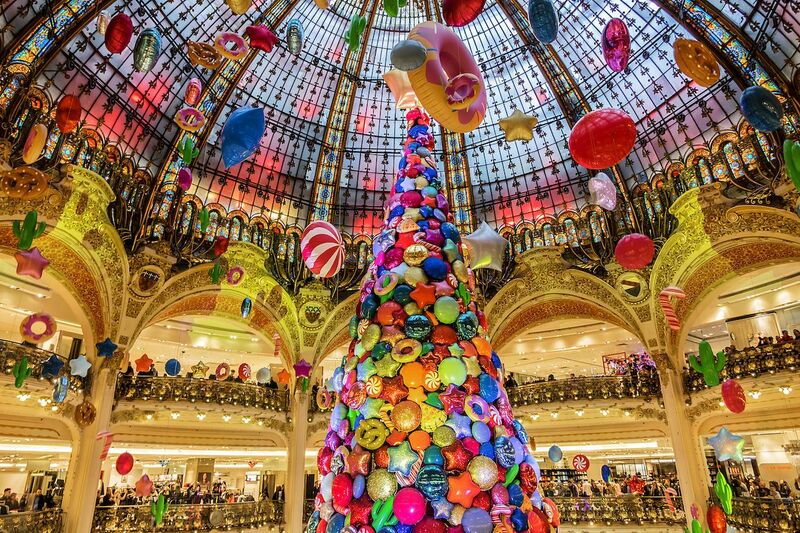 A stunning four-story Christmas tree is placed inside the Galeries Lafayette department store each year in Paris, France, and it always has a different theme to surprise and delight shoppers. Past themes have included “from another planet,” complete with meteoric decorations; “Arctic,” which was made entirely of paper by French artist Lorenzo Papace; and “Spectacular Spectacular,” from the film Moulin Rouge. This year’s tree is sponsored by luxury watchmaker Piaget and adorned in glittering greens and golds. Few things could better inspire holiday cheer than a mountain-sized Christmas tree made from hundreds of real, live pine trees. 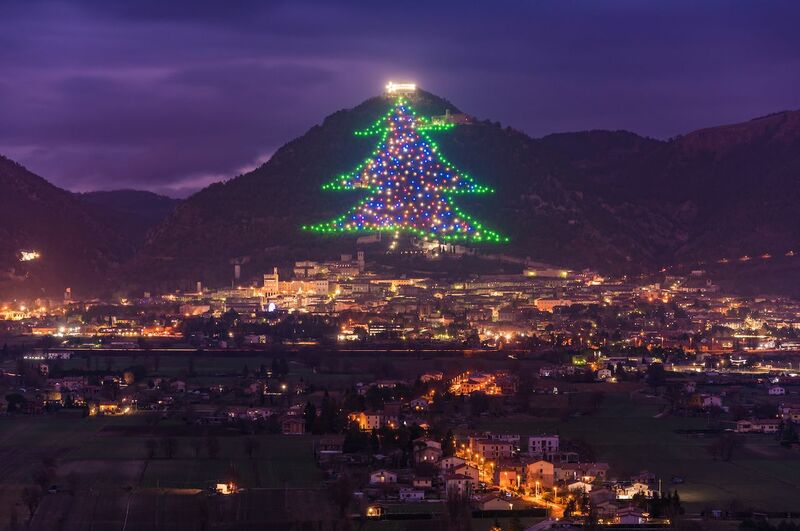 In Gubbio, Italy, individual trees on the slopes of Mount Ingino are outfitted with an array of lights to create the stunning visual of a 2,000-foot Christmas tree spanning the mountain from base to peak. Even better, the world’s largest Christmas tree is switched on by a notable figure each year, such as the Pope in 2014 (and in 2017, it was switched on from space!). The 27-meter-tall (about 88 feet) metal construction, which is made up of some 6,000 branches and over five kilometers of lighting, shines in the center of Vilnius’ Old Town and is visible to anyone flying over the Lithuanian capital city. Set in Cathedral Square, the Vilnius Christmas tree is illuminated in a myriad of colors and even provides visitors with the chance to walk around under the blanket of lights, giving them the feeling of being inside the dazzling Christmas tree. Surrounded by a traditional Christmas market, the display also features Christmas toys and covers over 26,000 square feet in total. 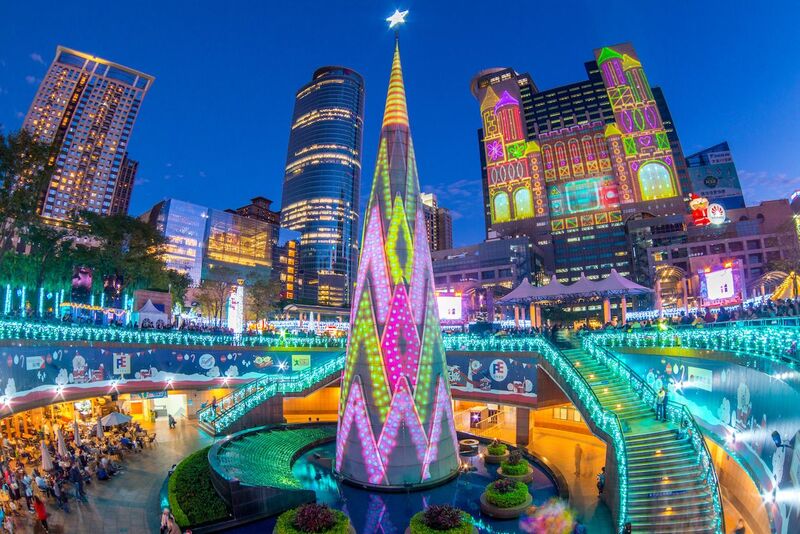 Situated in front of Taipei City Hall, the Taipei Christmas tree is the centerpiece that helps transform the entire area into what’s known as Christmasland, a full-on Christmas playground. Christmas is not a recognized public holiday in Taiwan, but that doesn’t stop its citizens from joining in on the holiday fun. Other highlights of Taipei’s Christmasland include a Christmas market, carolers, over-the-top decorations, and even a Christmas fair with rides. 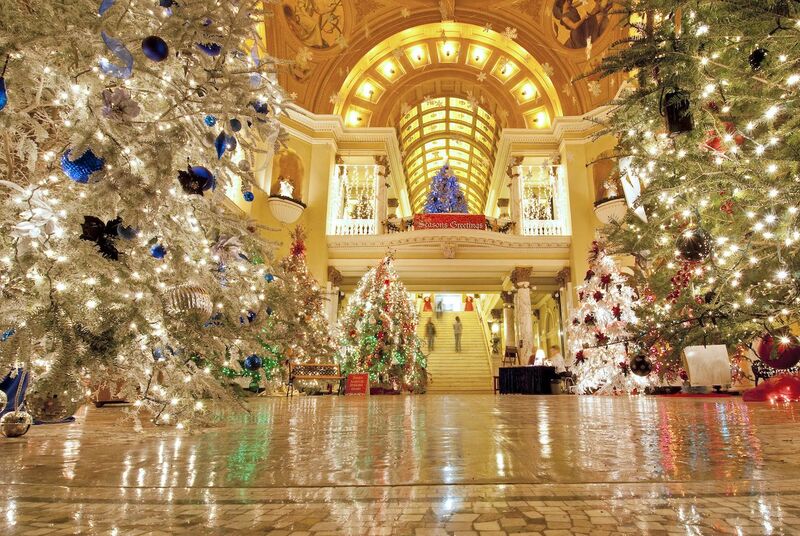 Most people head to South Dakota for a glimpse of Mount Rushmore, but travelers visiting the state around Christmas can enjoy a walk through 90 Christmas trees on display at Christmas at the Capitol in Pierre. The trees are decorated by businesses, nonprofit organizations, communities, and government offices from all over the state of South Dakota. The official South Dakota Christmas tree is the centerpiece of the annual celebration and is decorated with ornaments and pine cone balls made by locals in Black Hills.